Tallulah Falls is a series of six waterfalls cascading through Tallulah Gorge, an ancient 1,000-foot chasm carved by the Tallulah River. The Town of Tallulah Falls is on Highway 441/23 in the northeast corner of the scenic Georgia mountians, 90 minutes north of Atlanta and two hours south of Asheville, NC. 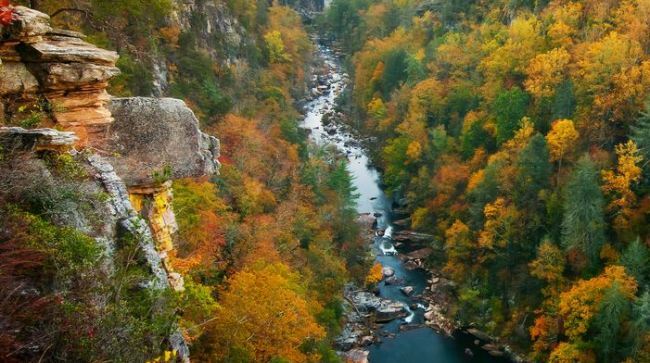 Tallulah Gorge State Park has overlooks, nature trails and a suspension bridge. Tallulah Station offers local artwork as well as specialty coffees and sweets. Hike the Shortline Trail, a three-mile paved trail following an old railroad bed. Tallulah Falls rose to prominence as a resort area in the late 19th century. Early in the 20th century, after a fierce struggle with conservationists, Georgia Power Company dammed the waterfalls and constructed a large hydroelectric facility at the site. The Cherokee Indians, who lived in the area before the European settlers arrived in 1820, called the falls Ugunyi; but the settlers named the gorge and falls Tallulah. While the Cherokee viewed the falls with trepidation and largely avoided the area, white settlers and travelers commented on the awe-inspiring beauty of the falls and gorge in newspapers and travel books. Some visitors compared Tallulah Falls to other legendary cataracts, and Tallulah was soon dubbed the "Niagara of the South." As word of Tallulah Falls' beauty spread in the mid-19th century, more visitors started making the trek to the north Georgia mountains. By the early 19th century, local as well as national writers extolled this scenic wonder to broad readerships, which increased its allure to tourists who had to travel for days over mountain trails to see it. 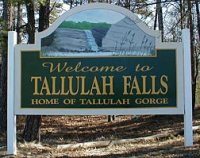 The town of Tallulah Falls was incorprated on October 7, 1885. The founders were Colonel Rufus Lafayette Moss Sr., Thomas Abraham Robinson, J.M. Cartledge, William Berry and William D. Young. Tallulah Gorge was owned by Colonel Rufus Lafayette Moss Sr., and he was also the founder of the Tallulah Falls Railroad in 1870. The extension of the railroad in 1882 decreased the travel time from Atlanta to Tallulah Falls from days to hours and made the trip affordable for more Georgians. Nearly twenty hotels and boarding houses sprang up around the falls to accommodate the increased number of visitors. While the tourist industry flourished, the hydroelectric industry was just beginning to expand in Georgia. Several corporations vied for the right to develop Tallulah Falls; the Georgia Power Company eventually emerged as the only company capable of completing the project. Helen Dortch Longstreet, widow of Confederate general James Longstreet and a resident of nearby Gainesville, feared that the construction of the dam would destroy the falls and detract from the area's beauty. She organized the Tallulah Falls Conservation Association in 1911 to stop construction of the dam and turn the area into a state park. This was one of the first conservation movements in Georgia. In 1912, Longstreet successfully lobbied the state legislature to force the attorney general to bring suit in an attempt to stop the dam. Even before Georgia Power officials defeated Longstreet's efforts in a jury trial in Rabun County in the spring of 1913 and in an appeal to the state supreme court, construction had proceeded on the largest hydroelectric development in Georgia. When completed later that year, the dam was a masonry structure 116 feet tall and 400 feet long creating a 63-acre lake. A 6,666 feet long underground tunnel, blasted through solid rock, took water from the lake to a holding area above the powerhouse, where it fell 608 feet and was converted into electricity. The Tallulah project became the centerpiece of a multi-dam project on the Tallulah and Tugaloo rivers, which provided electricity for Atlanta and the rest of north Georgia. The dam, once the largest single producer of electricity in the state, is still in operation but is now a minor component in a huge system. In 1992, nearly 80 years after the completion of the dam, the state, in partnership with Georgia Power, created Tallulah Gorge State Park, one of the most popular in the state park system. Visitors enjoy activities on the lake and hiking through the gorge, and controlled releases from the dam allow them to hear the roar of the falls on selected weekends in the spring and autumn. The trail around the gorge is named for Helen Dortch Longstreet.